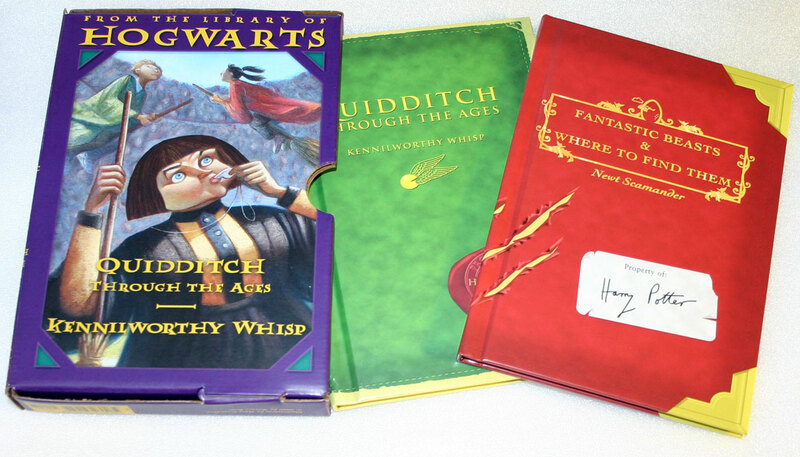 A Literary Odyssey: The Harry Potter Schoolbooks. I am participating in Jenna's readalong of the Harry Potter series through December 15th, and I made some great progress at the very beginning of last month (I flew through the schoolbooks, Beedle the Bard, and the first 5 books in about a week and a half). I figured it was time I actually start writing about those books and my impressions. First, I should tell you that with the exception of the schoolbooks, I have read the series numerous times. I love Harry Potter and the world Rowling created. I will apologize in advance if my fan-girling gets a little nuts, or I talk about the books in general. I will try not to give away any spoilers to the handful of you who haven't read the books, but I can't promise anything. I decided to start off the readalong by reading the schoolbooks. These are the only books in the Harry Potter world that I hadn't read before. I know that my sister owned them, but I guess I never read them? Actually finding copies of them was difficult. I had to visit three bookstores before I found the box set pictured above. I found that odd, but nevertheless, I have them in their new hardcover glory sitting on my shelf. 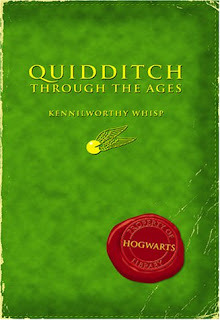 I began with this title for a couple of reasons...mainly that I wanted to save Quidditch until later. :) I thought this one would be the least interesting of the two. 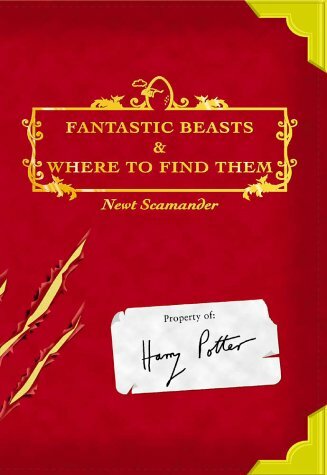 Fantastic Beasts is essentially an encyclopedia of the creatures found in the Harry Potter world. There are some notable exceptions to what's in here-goblins are not classified as beasts, so they aren't in here while centaurs are (centaurs asked to be labeled as beasts). I found the classification notes interesting, and as I began reading the series, it would pop up in my head. Each entry has a label of how dangerous the creature might be. Some entries have scribbles from Harry and friends in the margins-I wish there had been more of this. Their little quips and insights were charming and cute, but sometimes pages would go by before another one. I wanted more! There are some pictures to display some of the creatures-especially the ones that don't appear in the series. Again, I found it quite charming! I enjoyed the little sketches and the little bits of humor Rowling injected into the book. My one qualm with the book didn't even pop into my head until I was reading book 4...the blast-ended skrewts that are Hagrid's obsession are not in the book! I'm sure this has something to do with when the schoolbook was originally published to when the fourth book came out, but I was a little surprised. That was the only missing beast that popped into my head, but I wonder if there are more? All in all, this was an enjoyable little read, and it only took me an hour or so to get through. It was entertaining for me since I had already read the series multiple times and was a great way to get back into the mindset for the universe. Whereas Fantastic Beasts was a schoolbook belonging to Harry, this title was part of Hogwarts' library. I loved the little touch of seeing the list of team members who checked the book out prior to Harry. That's what makes specialty books like this worth it! 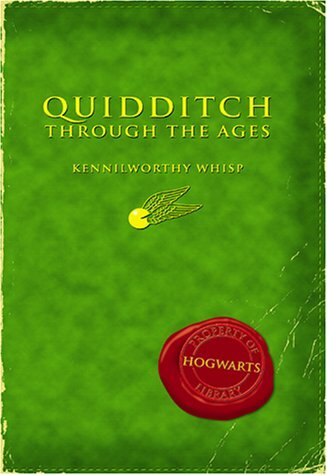 Like Fantastic Beasts, this is just a slim volume that talks about one of the obsessions in the Harry Potter world-that of Quidditch-the wizards' game played on broomsticks. Reading the books, I have always been a fan of the game that Rowling invented for her wizards and witches. And when I was away at college, we had an intramural Quidditch program (sadly played on the ground, but you did have to pretend to be sitting on a broomstick). Quidditch is one of the many touches in the books that makes the whole world feel real, you know? Anyway, this title talks about how the game was created, some notable teams around the world, and special moves, like the Wronski Feint. I think I enjoyed this one far more than the previous title only because it read straight through and wasn't disjointed in entries (makes sense, right?). I learned some interesting things about the sport so that when I started reading and Harry started playing Quidditch, I picked up a few things! Both books were great little reads and a great reintroduction to Harry Potter and Hogwarts. I would definitely recommend both titles to people who have read the series and loved them, since reading them before would just confuse you. :) I do wish Rowling would write more of the schoolbooks in the future (Hogwarts, A History anyone? ), but that's just wishful thinking. I think she has left the world of Harry Potter behind her for now. Let's keep our fingers crossed though! Onto The Tales of Beedle the Bard! I really enjoyed these books too!!! And Beedle the Bard is just fabulous as well!!! Can't wait to read what you think of that one! I actually have the special edition of it. You should look it up and see what that one looks like! I haven't read the school books, but now I want to!!! I completely agree with you about forgetting how wonderful that world is until you're back in the middle of it. I've read the school books and I will say I think the Beedle the Bard is my favorite of the bunch. I never even knew about these schoolbooks! I bought The Tales of Beedle the Bard for my kids but missed this. Going on their Christmas lists, for sure, thanks! Heh, I love those 2 little books (and the fact that the profits went to charity). Absolutely adorable! These are really good and fun books to read to get a little more info on the world of Harry Potter. Can easily finish both of these in a day.